The move to ask the United Nations to recognize a Palestinian state based on 1967 borders is being questioned within the Palestinian Authority itself. Some Palestinian officials are coming to the conclusion that a vote by the United Nations General Assembly would be only a symbolic victory, and would leave them with no way to follow up, according to Ynet. A General Assembly resolution would not be binding. A Security Council resolution would be binding, but it would be vetoed by the United States. "We are trapped with September," said one Palestinian official. "We don’t know what to do after that." As a result, Palestinian President Mahmoud Abbas would like to find a way to drop the U.N. plans, but feels compelled to continue with the request in order to maintain his credibility, after being so insistent about it in the past. 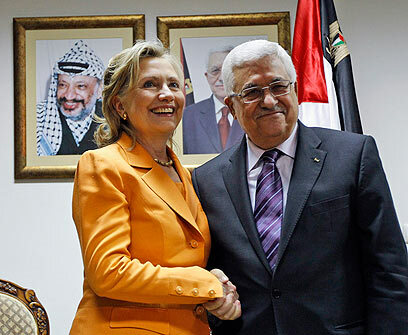 Instead, Abbas has indicated that he would like to revive the "peace process," along the lines suggested by President Obama's recent Mideast policy speech. Abbas has already indicated an interest in a proposal by France to convene Palestinian and Israeli negotiators in July, according to VOA. It's thought that there's no hope of a revived peace process if the Palestinians go ahead with request for unilateral state recognition. Not surprisingly, the Israelis would be very pleased by a decision not to pursue a General Assembly vote. The Israelis fear that the Palestinian initiative will harm Israel’s legitimacy and wreck any hope of reviving peace negotiations, according to the Independent. Thus, Israel has been conducting an international diplomatic effort to convince as many nations as possible to oppose the initiative. These decisions are all occurring in the context of widespread chaos throughout the entire Mideast region, brought about by numerous Arab uprisings. Recently, this has been particularly true in Syria. An international furor recently arose when Palestinian refugees and their descendants crossed into Israel from Syria, and other places, and were met with live fire from the totally surprised Israel Defense Force (IDF). A similar confrontation occurred last weekend, but international reaction was subdued after it became apparent that it was incited by Syrian president Bashar al-Assad to deflect attention from his own bloody massacres of peacefully demonstrating Syrians. However, there's at least one Arab uprising development that the Palestinians AND the Israelis are afraid of -- an Arab uprising in the West Bank. There's already been an uprising in Gaza, and Hamas put it down because it was targeted at Hamas. But an uprising in the West Bank would potentially target both the Palestinian Authority and Israel, and then anything could happen.